APAH manages high-quality, attractive buildings that our residents love to come home to. At The Springs, we recently installed several art pieces that celebrate the diversity of the Arlington community. Thank you to Lloyd Wolf and The Artist Circle for your beautiful and inspiring vision. Living Diversity at the Virginia Festival of the Book: A State of Many Nations. Chief photographer Lloyd Wolf was part of a panel at the Culbreath Theater of the University of Virginia in Charlottesville VA on March 17, 2016. He joined NPR reporter Tom Gjelten and author Gustavo Perez, along with moderator David Martin in presenting “a combination of stories, data, and images related to Virginia’s changing demographic and the faces, cultures, and voices of non-Anglo and non-white immigrants.” The program was part of the Virginia Festival of the Book, produced by the Virginia Foundation for the Humanities. A photography exhibit from our book Living Diversity will fill the street space at Arlington Mill Community Center, showcasing 50 portraits of life on Columbia Pike from these photographers, as well as the Indie Photobook Library, a collection of independently published photo books collected and curated by Arlingtonian Larissa Leclair. 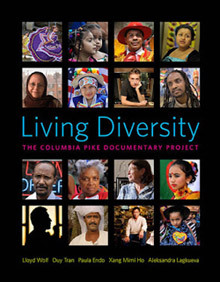 Living Diversity will be available for purchase at event. Gallery hours are 11:00 a.m. – 5:00 p.m. Reception 3:00 – 5:00 p.m. Sponsored by the Columbia Pike Revitalization Organization. 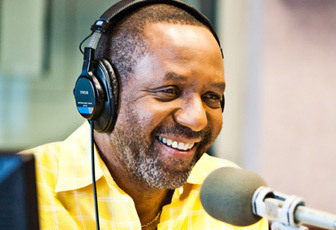 Lloyd Wolf will be a special guest on the The Kojo Nnamdi Show. Tune in on Thursday, August 20 at noon, on WAMU 88.5 FM. For a direct link to the interview, follow this link.